In light of recent events, it seemed fitting to place online the complete text of Chapter 12 of my book Resurgent in the Midst of Crisis: Sacred Liturgy, the Traditional Latin Mass, and Renewal in the Church (Kettering, OH: Angelico Press, 2014), 158-165, with the publisher's permission. 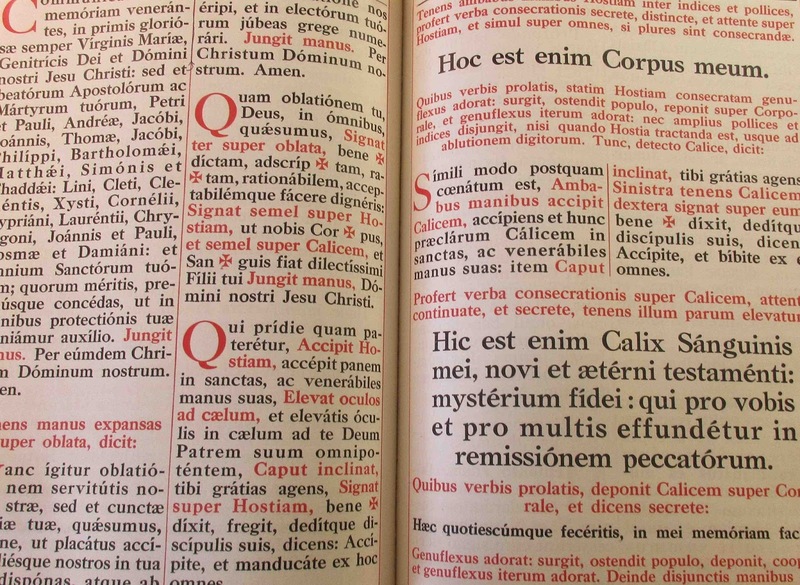 Many convincing arguments can be and have been given in favor of preserving the Latin language in the liturgical life of the Roman Catholic Church—as even the Second Vatican Council’s Constitution on the Sacred Liturgy Sacrosanctum Concilium (1963) stated that it should be, following close on the heels of John XXIII’s remarkable Apostolic Constitution Veterum Sapientia of 1962. As we all know, Pope John XXIII’s and the Council’s reaffirmations of Latin in the liturgy were more or less cancelled out completely by the ill-considered decisions of Pope Paul VI, who once more demonstrated to the world that if the pope enjoys the charism of infallibility when teaching the truths of faith and morals, he enjoys no such gift in regard to particular prudential judgments, including the dispositions of the liturgy in its changeable elements. In any case, my purpose in this chapter is not to catalog and review the many arguments in favor of Latin, a task that has already been well explored by others, but merely to speak of some of my own personal experiences of where and when the impressive unity of Latin would have made so much more sense in real life than the Babel of vernacular languages. My wife and I lived in Austria for seven and a half years. Being in Europe convinced me past all doubt that the switch after the Council to an exclusive use of the vernacular for the Mass was the most foolish and nearsighted change that could have been made. Instead of making the Mass more deeply accessible, it localizes, particularizes, and relativizes it, shutting off everyone who does not speak the local tongue; traveling or immigrant Catholics are thrust into a foreign environment that alienates them far more than the solemn Latin liturgy ever alienated the simplest peasant. In fact, due to its pervasive aura of sacredness and its perceptible focus on the mystery of the Eucharist, the traditional liturgy, even when the words are not fully understood, shapes the soul better than the new liturgy when cerebrally understood. The irony can be seen on many levels. First, Latin is universal and is not the daily language of any modern nation or people. There is no cultural imperialism in the use of Latin, but rather a visible sign of the Church of Christ reaching out to all nations, leading them back to unity in one faith, one communion, one worship of God. If the use of Latin were argued to be a form of cultural imperialism, we would have to go further and say that proclaiming and preaching the Trinity or the Incarnation is a form of theological imperialism destructive of pagan African, Asian, and European cultures and religions, or that the very use of the same Mass, the same missal (in however many vernacular tongues), is a form of liturgical imperialism destructive of the peculiar ways that an Aborigine might choose to worship Christ. There is no escaping this logic: if you deny the fittingness of a universal presence of Latin, a universality insisted on by none other than St. John XXIII, you are on the road to denying the universality of Christian doctrine and worship as such. Why acknowledge or adhere to any type of transcultural and transhistorical unity—why not opt for total pluralism, as postmodernism has done? Or perhaps I should say, as postmodernism has attempted to do, since one cannot exalt total pluralism without denying the intelligibility of communication and therefore rendering null and void the entire project. Second, modern Europeans in general are strongly multilingual, which would make Latin easy enough for them to get used to, as indeed they once were accustomed to it not many decades ago. There has never been an age when Latin would be more accessible than now, precisely on account of the “globalization” taking place. If men of Switzerland or Denmark can and often must speak several languages, what would be the difficulty of liturgy in Latin? It would be a source of international unity among believers, far more than idiosyncratic local liturgies could ever be. In those years in Europe, I participated in many liturgies that would have gone far more smoothly had they simply been in Latin. On my sole visit to Lourdes, I attended a Mass in which the languages were being shifted constantly to accommodate the international congregation, an elaborate show of linguistic gymnastics that I found highly distracting, and it was almost impossible for me to pray. The already overly verbal and self-involved character of the new liturgy was heightened all the more by this preoccupation with proportional coverage of language groups. Third, and building on the last point, because literacy has spread everywhere, large numbers of people are in a position to follow along with a hand missal or a booklet that reproduces the Ordinary of the Mass. Even the illiterate, who often enjoy (in compensation, as it were) a rich oral culture and a high level of intuitive understanding, will benefit from sermons in their own tongue that explain the Mass, as Romano Guardini explained it to his German congregations. Moreover, as Jacques Maritain says in Peasant of the Garonne, the believer who, by simply kneeling at Mass and letting his mind be drawn to heavenly things, is caught up in silent worship of God, does not need words, missals, long readings and sermons; it is enough for him to be there. As the peasant in the parish of the Curé of Ars put it: “He looks at me and I look at Him.” When the liturgy breaks this immediate spiritual contact in favor of verbal didacticism, it does a disservice to the spiritual lives of believers. Fourth, the longed-for fraternity of nations and peace on earth—what could serve this aspiration better than a liturgy everywhere the same? An American traveling in France, a German traveling in Spain, an Italian traveling in Denmark, indeed an Asian in Africa or an Indian in Australia, all of them would find themselves “back home” in the local parish church. And given the importance G.K. Chesterton and Gabriel Marcel rightly place on this deep and inexpressibly consoling feeling of “being at home,” should not the Church do everything in her power to make the liturgy the very place where one can always be at home, no matter where one is? Not, of course, by making the liturgy chummy and casual, but by ensuring that it remains deeply familiar in its identity, coherence, consistency, and stability. It is, or should be, a single solemn act of adoration of the Blessed Trinity that never varies in spirit from the rising of the sun to its setting. As Our Lord says: “Believe me, the hour is coming when neither on this mountain nor in Jerusalem will you worship the Father. . . . The true worshipers will worship the Father in spirit and truth” (Jn 4:21, 23). This was once a common experience of Catholics. In spite of vast differences of peoples, cultures, and circumstances, the sacred liturgy was truly universal and unified, so that one encountered the beautiful face of Christ in the face of his Church everywhere. Lamentably, the Church of today gives quite a different impression, one of democratic diversity, with many different masters served on as many different mountains. We are living in the age of travel, the age of the “global village.” At least in the Western world, almost everyone travels at some point or another; there has never been a time in the entire history of the world when so large a number of people take trips within their country as well as to foreign countries. How foolish it was to break down the universal mode of worship just when it has become more needed than ever! The usus antiquior emphatically illustrates and admirably furthers the purpose of human brotherhood—and, as Henri de Lubac observes, there is definitive brotherhood only in a common adoration of God. In the realm of the Novus Ordo, however, the liturgical celebrations illustrate a diversity or plurality that is not traced back to unity and universality, as is painfully evident to a traveler who speaks few or no other languages than his own. Once upon a time, parishes and chapels across the entire globe testified to the profound inner unity of the Catholic (that is, universal) Church; now there is only the Protestant phenomenon of localization. This last point deserves a bit of development. 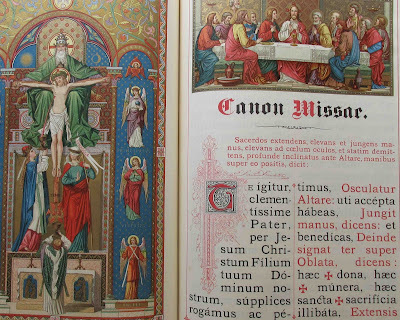 The era of the traditional liturgy in fact left much room for inculturation or local adaptation, whether in the design of churches, in the style of vestments, in the layout and decoration of sanctuaries, or in popular hymns, carols, and processions. Nevertheless, the one constant axis was the Holy Sacrifice of the Mass, which testified in its very language and ritual to an unbroken unity with Rome, the mystical-historical seat of the Church founded by Christ. The incarnational scandal of the particular was never sacrificed in view of temporary and superficial gains; Christ was never declared to be an African or an Asian, a female or a hermaphrodite, in order to win converts from paganism, feminism, gnosticism, etc. The Faith is founded on the rock of Peter, by providence Bishop of Rome, and this utmost particularity will remain until the end of time, as an image of the even greater scandal of the particularity of Christ, a Jewish man born in Nazareth during the heyday of the Roman Empire. The Chinese Catholic, as a man and as Chinese, worships God in communion with Rome. This is what the old liturgy proclaimed, in blissful and holy ignorance of the shallow charge of “cultural imperialism,” which of course the proclamation of truth can never be, even though the Gospel was given to mankind through the most particular of all particular circumstances. Some years ago, I was taken aback when a friend forwarded me a discussion by a conservative Catholic apologist who had come out in full arms and armor to defend the vernacularization of the Mass after the Council. My first impression was that his panoply of arguments, though reasonable-sounding, had already been rehearsed by the promoters of the Consilium’s “reform” back in the 1960s, and had not gained in truth or persuasiveness with the intervening decades. My second impression was that I was looking at a case of old-fashioned dissent in respect of Pope John XXIII’s Apostolic Constitution Veterum Sapientia, which declared Latin to be the permanent and preeminent language of the Roman Catholic Church’s worship and theology. This Constitution has been endlessly violated since its promulgation, but it has never been rescinded nor its contents abrogated. It may be that a future pope will be able to take it up again with praise when the full effects of Summorum Pontificum have permeated the Church. In any case, the apologist argued that Latin was the common language of ancient Rome, and so we ought to be using the common language of our day and age. Well, Latin certainly was the common language of many members of the Catholic Church once upon a time, in the declining Roman Empire, but already in the early Middle Ages, with the invasions of barbarian tribes speaking a plethora of languages, Latin became more and more a monastic and academic tongue, and at the popular level morphed into early forms of the Romance languages, such as the Italian dialect in which Dante wrote his Divine Comedy, or the Neapolitan dialect St. Thomas Aquinas used when preaching in his native territory. Thus, we may safely say that for over a thousand years the Catholic Church was worshiping in a language that had become a fixed, formal, sacred language, just as Hindus use Sanskrit, Jews Hebrew, Muslims Arabic, and so on. It was also plain silly for this apologist to assert that most people in the old days did not understand what was going on at Mass. From what I can tell, it seems fair to say that far more people in the old days knew what was going on at Mass—essentially—and why it was important, than people know nowadays, even though the Mass is in their own language. Now, I would not blame the language for this; I rather blame the clergy, as well as the wretched translation of the Novus Ordo that was foisted upon the faithful by the original ICEL, malforming congregations for forty-five years. Still, the tectonic shift in language signified in the popular mind a shift in the very meaning of what was taking place in church, and hence, over time, a further deviation in the faith of the people regarding the Holy Sacrifice of the Mass. Will it ever be possible to calculate the damage done to the Church by the banishment of Latin from her public worship? I think not. We have little conception of the true extent of the harm, just as we have trouble imagining the size of the earth, the solar system, or the galaxy we are in. By the sudden cessation and replacement of the solemn sacred language that for over 1,500 years had been the tongue, the voice, part of the inmost character, of the Western Church, the opinion already circulating at the time of the Council that the past is meaningless to the present and the present must be liberated from the past was confirmed and, as it were, institutionalized. In the very fact of vernacular worship is embodied the hermeneutic of rupture and discontinuity, a feeling of superior enlightenment and superior mission, as though now we finally understand, now we finally know what we are to do in the modern world. “Fools, for they have not far-reaching minds,” as Empedocles once said. What we ought to do in the modern world is nothing other than precisely what we have always been doing in every age. The mistake was thinking that we could do better. For our punishment, we have been permitted not only to do much worse, but to burn many of the bridges that lead back to doing better. Although he hated many features of the Catholic liturgy after his break from Rome, Martin Luther retained respect for the Latin tongue. Actually, the case is even more embarrassing for today’s Latin-loathing Catholics, inasmuch as Luther had the basic psychological insight to realize that Latin adds something to the liturgy and that it should not simply be thrown out, as can be seen in his preservation of the Latin language in Lutheran worship—a custom that lasted well into the time of Johann Sebastian Bach, whose more compact settings of the Gloria and Sanctus are not crypto-Catholic oddities but perfectly useful Lutheran church music. Is it not long past the time when the Pope and the appropriate dicasteries at the Vatican should do something about this travesty, this amnesia of our own identity, history, culture, and mother tongue of worship? Maybe someday historians will be able to look back and see that Summorum Pontificum marked a decisive shift in the “language wars”—a phrase by which I advert not to the more pedestrian, albeit still important, question of whether the Ordinary Form is well translated, but rather, to the more intriguing and more consequential question of whether a liturgy that has been cut off from its age-old roots in the Latin language and the piety of the Latin rite can survive in the long run. Maybe the motu proprio [SP] marks the beginning of a movement that will culminate, decades or centuries later, in the rightful triumph of the Latin liturgy, the Mass of our forefathers, the Mass of the ages. For this quixotic but, with God’s power, manifestly achievable goal, we should certainly not fail to get on our knees to pray: Miserere nobis, Domine. 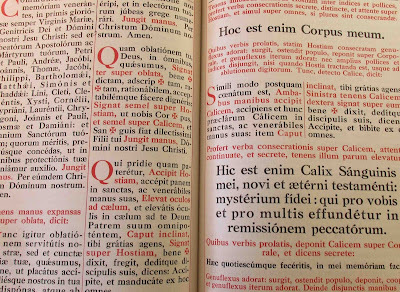 Sacrosanctum Concilium states: “Particular law remaining in force, the use of the Latin language is to be preserved in the Latin rites” (36.1); “steps should be taken so that the faithful may also be able to say or to sing together in Latin those parts of the Ordinary of the Mass which pertain to them” (54); “In accordance with the centuries-old tradition of the Latin rite, the Latin language is to be retained by clerics in the divine office” (101.1). Even Annibale Bugnini writes in his memoirs: “The conclusion reached in this debate [between partisans of Latin and partisans of the vernacular] was ultimately set forth in Chapter I of the Constitution on the Liturgy, where the question is answered in a way that reconciles the rights of Latin and the need of the vernaculars in celebrations with the people” (The Reform of the Liturgy [Collegeville: Liturgical Press, 1990], 25). Would that the rights of Latin had been respected by Paul VI. Although I sympathize with many arguments given by supporters of the “reform of the reform,” I cannot agree with their contention that Latin has always remained the language of the liturgy. It is, of course, the language of the editio typica on which translations are based, but the Vatican has done next to nothing in the past forty-five years to ensure that Latin remain the language of the Novus Ordo Mass anywhere. 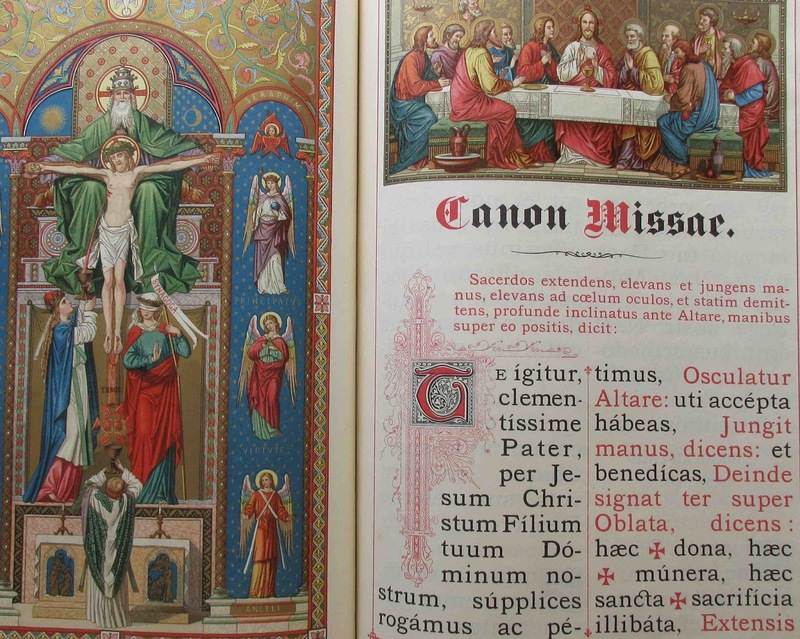 Already when Paul VI introduced the new missal, he lamented the loss of Latin it would bring, and said we ought to consider this painful sacrifice worth it in view of how well the vernacular would serve the contemporary needs of the Church. Whenever John Paul II mentioned Latin, he reserved for it a small place, not the dominant place given it by John XXIII and Vatican II. Nor did Pope Benedict XVI see to it that the Ordinary Form be celebrated far and wide in its Latin typical edition; rather, he encouraged the rediscovery and spread of the Extraordinary Form, which, Deo gratias, remains in the Church’s mother tongue.